Recently released from jail, the aging Tony le Stephanois (Jean Servais) is reluctant to return to a life of crime until he discovers that his girlfriend has thrown him over for a rival gangster so agrees to attempt one last job. 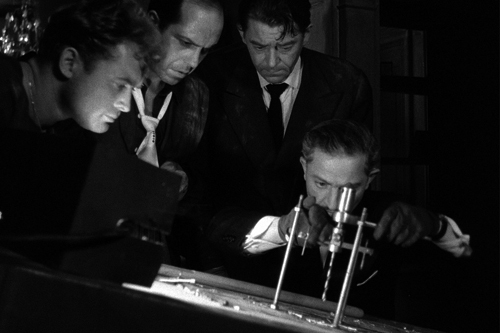 Together with three collaborators - young father Jo (Carl Mohner), boisterous Franco-Italian Mario (Robert Manuel) and sentimental Milanese safecracker Cesar (played by Jules Dassin under the pseudonym of Perlo Vita) - Tony meticulously engineers his biggest heist yet: robbing the most heavily guarded jeweller in Paris. But when a rival gangster, Pierre Gruter (Marcel Lupovici) finds out about their haul, he stakes a claim to a cut of the take in a most persuasive manner. Screening followed by a discussion with Pierre Fourniaud, General Director of the French publishing house La Manufacture de livres specialising in gangsters’ biographies and crime novels. In 2010 he published a new edition of Le Breton’s “Les Pégriots” (2010) which tells the true story of ‘Jo la terreur’ – one of the latest ‘knights’ of the early 20th century Parisian mob. Les Pégriots will be soon adapted by actor and film director Olivier Marchal (‘36’, ‘MR73’, ‘Braquo’…). Discussion chaired by Martine Pierquin, Course Organiser and Film Tutor at the University of Edinburgh.